Bayhorse Silver Inc, (The “Company” or “Bayhorse”) TSX-V: BHS reports on operations at its 100% controlled Bayhorse Silver Mine (the “Mine”), Oregon, USA. On September 24, 2018 the Company issued a news release on a National Instrument (NI)-43-101 Maiden Inferred Mineral Resource for its 100% controlled Bayhorse Silver Mine, Oregon, USA. The maiden resource is comprised of 292,300 short tons at an average grade of 21.65 (673.4 g/t) troy ounces per ton (opt) silver (Ag) for total contained silver of 6,328,400 ounces*. The mineralized material contains significant amounts of copper (Cu) and zinc (Zn), however the historic data utilized in the mineral resource estimate did not allow for a reliable estimation of Cu and Zn grades. The Company has established an all-weather storage pad outside the main portal, and is ready to erect a cover over the pad to ensure any mineralized material stored outside the Mine for processing through the Company’s Steinert Ore-Sorter, will not be affected by winter conditions, such as snow and ice. Since reopening the western end of the underground workings the Company has inspected and rehabilitated a number of the historic slusher drifts that were installed by Silver King Mines in the 1980’in preparation for mining the western zone of the deposit, much of which is unmined. The historical western most workings comprise a horizontal distance of about 320 feet (~95 m) from the western end of Big Dog Zone. The mineralization is flat lying to shallow south dipping above the main historic haulage-way for approximately 30 – 40 feet. To the north, the mineralization then appears to incline upward toward the north at approximately 45 to 70 degrees for another 60-70 feet for a total horizontal across strike width of approximately 100 feet. The southern end of the flat lying area of mineralization appears to dip to the south. An underground drilling program is proposed to test the north and south extensions to the mineralization. The thickness of the mineralization has historically been reported as between 20 feet to 40 feet. The Company has developed a 20 foot vertical raise from the main haulage level up in mineralization, and was still in mineralization at 30 feet. The raise and working stope is 50 feet south of, and towards what was reported by Silver King Mines as a 1,000 ton block of mineralized material, The raise and working stope are being developed in mineralized material and suggest the block identified on the historic plans 50 feet to the north may be more extensive than historically reported. 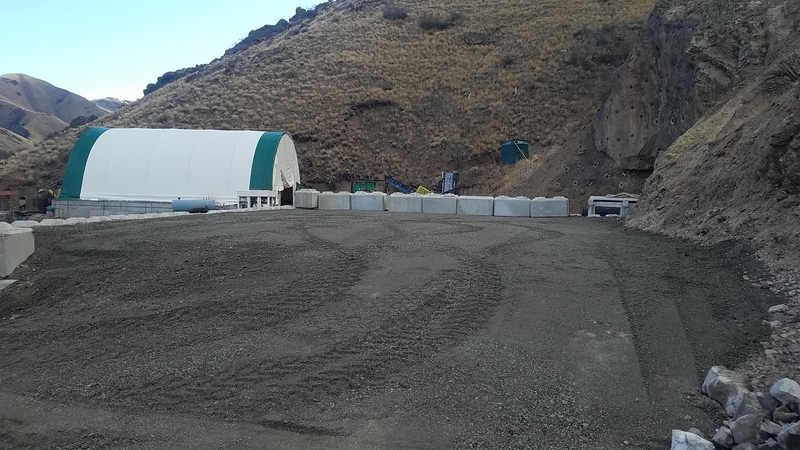 The Company has extracted a bulk sample from the raise and stope in excess of 1,200 tons of mineralized material already from this zone and has commenced storing it on the all-weather pad. Samples taken from the extracted material have been submitted for assay and assays are pending. The Bayhorse silver mineralization comprises mainly tetrahedrite-tennantite, that is the main copper-silver mineral and, including the other metallic minerals, such as chalcopyrite, sphalerite, galena and pyrite will be concentrated and upgraded into a dry concentrate through the use of the Steinert ore-sorter.A sampling protocol is being instituted along with QAQC inserted samples to determine ongoing head grades of the material being bulk sampled and processed through the Ore-Sorter and gravity separation for the fines. No economic evaluations have been completed on the Bayhorse silver deposit, and as a result a formal lower cut-off for the mineralized zone has not been established. However, for the purposes of reporting the Project’s inferred mineral resource, the Company’s geological consultants, APEX Geoscience Ltd., utilized a lower silver cut-off grade corresponding to 7.5 opt Ag, which was based upon a conceptual overall mining and processing cost of approximately $US100 per ton, a silver price of US$15/ounce at the current US$/C$ Exchange rate of 0.7624/1.3117 and an assumed recovery of 90% for the mineralized material. Furthermore, based upon the consultant’s collective experience and site visits to the Project, the qualified persons (QPs) for the maiden inferred mineral resource concluded that the deposit has “reasonable prospects for eventual economic extraction”. * Inferred mineral resources are not mineral reserves. Mineral resources, which are not mineral reserves, do not have demonstrated economic viability. There has been insufficient exploration to allow for the classification of the inferred resources tabulated as an indicated or measured mineral resource, however, it is reasonably expected that the majority of the inferred mineral resources could be upgraded to indicated mineral resources with continued exploration. There is no guarantee that any part of the mineral resources discussed herein will be converted into a mineral reserve in the future. The estimate of mineral resources may be materially affected by environmental, permitting, legal, marketing or other relevant issues. The Company advises it is not basing any decision to produce silver and other metals on a feasibility study of mineral reserves demonstrating economic and technical viability and also advises there is increased uncertainty and specific economic and technical risks of failure with any production decision that is not based upon a feasibility study. These risks include drop in price of commodities produced, namely silver, copper, lead, and zinc, from the pricing used to make the production decision, failure of the grades of the produced material to fall within the parameters used to make the production decision, and changes in mining costs due to changes within the mine during development and potential future mining. There are also metallurgical recovery changes that cannot be anticipated at the time of production. This News Release has been prepared on behalf of the Bayhorse Silver Inc. Board of Directors, which accepts full responsibility for its contents. Dr. Stewart Jackson, P.Geo., a Qualified Person and Consultant to the Company has prepared, supervised the preparation of, and approved the technical content of this press release. Mr. Michael Dufresne, M.Sc., P.Geol., P.Geo., has supervised the preparation of and takes responsibility for the Mineral Resource Estimate, and is the President and a Principal of APEX Geoscience Ltd. Mr. Dufresne is independent of Bayhorse and is a Qualified Person and Consultant to the Company.